This summer has been a bit of a muddle for the Boo Roo and Tigger Too household, with a mixture of renovation plans that haven’t really gone to plan (more on that in a different post), bad weather and then Roo and Tigger spending their annual two weeks with Granny. However we had big plans to rectify the situation kick starting with a marathon drive from Great Yarmouth to Carlisle to collect the children before heading to stay in Uttoxeter before a visit to Alton Towers the next day. A gruelling 9 hours in the car for Mr Boo and I so we really needed somewhere comfortable to stay after a day filled with traffic jams, road works and toilet breaks (pregnancy bladder) so it seemed the obvious choice to book a Premier Inn for the evening. Having looked at various locations between Carlisle and Alton Towers we decided upon Uttoxeter as it would mean that we could enjoy a relaxed morning before a busy day at the theme park (thankfully the children treated us to a lay in). Premier Inn Uttoxeter is located with Uttoxeter Services. The hotel is split over two buildings within the service station with ample free parking. Now at first glance you might be put off by staying at service station thinking that it would be busy and noisy however we didn’t encounter any road noise or hear anything from the petrol station and services that were also located on site. In fact being based on a service station proved useful as we were able to fill up with diesel and supplies before heading out for the day. 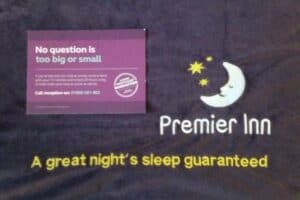 Staying at any Premier Inn you are covered by the ‘a great night’s sleep guaranteed’ policy. They aim for you to have a great night’s sleep and if you are experiencing any issues throughout your stay they want the option to try to rectify them and if you are still unhappy they will refund the cost of your stay. Great peace of mind when you are booking a location that you are unfamiliar with and knowing that there is someone available on reception 24 hours a day to help make your stay comfortable. We were located in second building on the site, next to The Water Bridge restaurant. With our room on the first floor it was strange to find that there was no lift in this building so we were thankful we had packed light and didn’t have to carry a pushchair etc. up the stairs. The room itself was light, bright and clean. When staying in a ‘budget hotel’ you can fall into the trap of thinking that things will be basic however with Premier Inn this is not the case. They have managed to get the mix of offering great priced hotel rooms whilst maintaining high standards for their rooms. A welcoming, comfortable stay is something that they strive for, for every room and every one who stays in their hotels. The room had been prepared for our stay with two single beds made up alongside our large double bed. The children instantly claimed which bed they wanted and Roo was especially pleased that hers was next to the mirror (once a poser, always a poser). The beds all included clean, fresh bedding with the choice of soft or firm pillows depending on your preference. With air conditioning included it meant that we were able to control the temperature of the room, a must-have when you have four hot bodies sleeping in one room (especially when one is pregnant and comes with their own central heating system). Included within the price of a Premier Inn room you are provided with different facilities to make your stay comfortable and help you with your packing too. From clean, fresh towels provided upon arrival and replenished throughout your stay as required (simply pop them in the bath once you have finished with them and fresh ones will delivered in the morning), to tea and coffee facilities which are always welcomed after a long drive and first thing in the morning. With shampoo/body wash also included within the spacious bathroom and a hair dryer it means less toiletries and accessories that need to be packed and carried when staying. Alongside the hotel is The Water Bridge which is a Table Table restaurant where you can book an evening meal and breakfast meal deal for just £23.99 per adult. We took advantage of this offer which was most welcomed after a long days driving. The evening meal includes a drink, main meal (up to the value of £15.00 which a small upgrade fee for higher priced meal) along with a dessert, meaning that we only needed to purchase the children’s meals separately. With the breakfast included within the meal deal the children also received a free breakfast which provided great value for money. Sudbury Hall and the National Trust Museum of Childhood – A short 10 minute drive away from the hotel and you can be enjoying one of the National Trust properties – A late 17th-century house with lavish interiors and the Museum of Childhood. The BBC Pride & Prejudice adaptation was filmed there so for me it makes a must-see venue. When we first arrived at Premier Inn Uttoxeter I have to confess to being worried about being on the site of a service station, however the Premier Inn and Table Table restaurant is located to one corner which is out-of-the-way of the main thoroughfare of the service station and we weren’t able to hear any noise from traffic or services throughout our stay. Our family room was clean and modern with all the facilities that we needed during our stay. The bathroom was large enough to enable us to pop the children in the bath, get them dried and dressed etc. without having to spill out into the main room. Personally I really like that there is the option to have a relaxing soak in the bath or pop into the shower depending on your preference and time available. 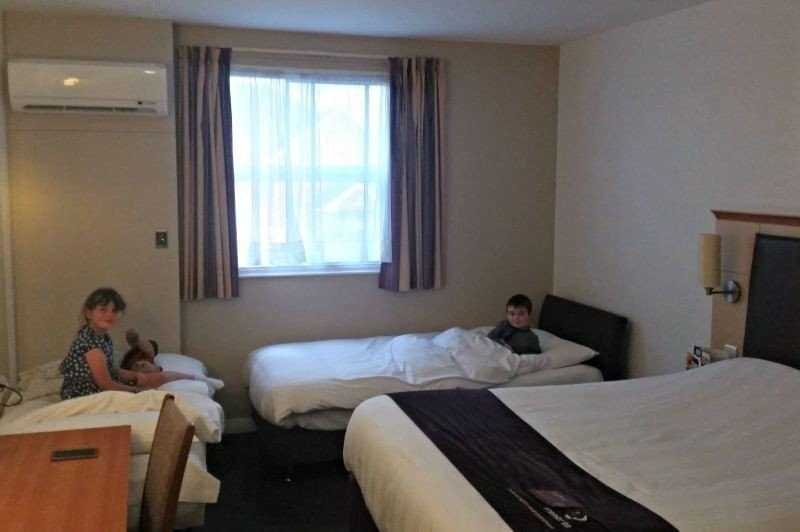 With the hotel being just 10 miles from Alton Towers I can see us booking a return visit later in the year as it made a convenient and comfortable overnight stay before heading out on some family fun. Disclosure: We received an overnight stay at Premier Inn Uttoxeter FOC for the purpose of review. I have always found premier inns an ideal base for exploring. you know what to expect and ive never been disappointed. The thing I like about Premier Inn’s is that you always know what you are getting – every one I’ve stayed in has been of the same good standard. Comfy beds too! It sounds like a great place to stay! Very handy for Alton Towers…. We’ve stayed in a family room at a Premier Inn in the past and have found it to be fabulous. Oooh I’m glad you liked it – we have family near there & may well stay there in the future! I’ve stayed in tons of Premier Inns in the past but never with kids.